Meet our passionate, multi-talented Spanish teachers! 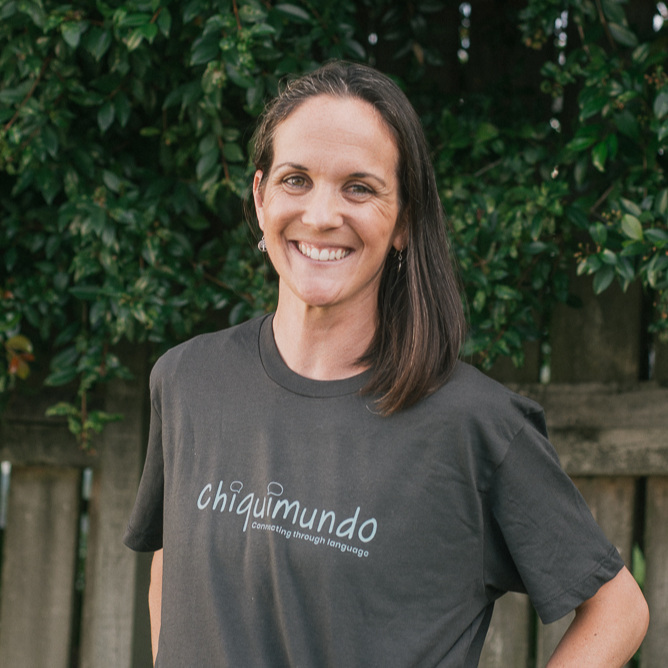 Megan Howie is the Chiquimundo director and currently teaches Spanish to children and adults of all ages (babies to grandparents!). Megan has a degree in Psychology and Spanish and is a qualified New Zealand Primary school teacher. She understands the influence we as adults have on children first-hand from years of working with children in their homes as a nanny, spending time teaching in marginal communities in South America, and she and her husband are now parents to two young bilingual daughters. Megan learned Spanish as an adult and is an advocate for learning languages in the early years, but is also passionate about continuing to learn through adulthood. She believes that any exposure to any language gives children a broader perspective, presents more cognitive challenges and paves the way for more language learning later in life. She is active in including parents in her classes so they too gain confidence communicating with their children in Spanish. Mercedes Napolitano is from Argentina but has called New Zealand her home since 2014. She has a BA in Visual Communication Design and a BA as Professor of Art and Design. Mercedes has taught visual arts and Spanish to students of different ages for more than 10 years. In her spare time she enjoys reading, traveling, playing Ultimate Frisbee and board games. For her, learning does not have to be synonymous with boredom but of discovery and fun. Through play and art you can learn in a meaningful and natural way. She believes that when you teach you are also learning and that is why she is passionate about teaching. Curiosity is something we should never lose. Claudia Molina was born in Bogotá, Colombia, She is a Social communicator and Journalist and has lived with her family in New Zealand for the last four years . During this time she has dedicated herself to teaching adults and children the richness of Spanish, and through games, music and dialogue. She has managed to impart on her students the interest and love for this language. She has identified with the methodology of Chiquimundo because she thinks it is easier to learn as a family, practising at home and create an environment where the use of Spanish is part of the daily routine. Anna Roquer was born in the city of Barcelona, Spain. She first came to visit New Zealand in 2012 and since then has been coming year after year on holiday to enjoy the country and discovering new ways to understand the world. In love with the landscapes, lifestyle and the people, in 2017 she decided to move with her partner to Auckland and begin a new stage of her life. Anna holds a Master’s Degree in Clinical Psychology and is a qualified Spanish Teacher. She is extremely passionate about her work and enjoys transmitting her culture and language. With experience working with children and families she believes that the best way to learn a new language is through the creation of an interactive, motivating and trustworthy space, that encourages fun and creativity. She loves different cultures, music, theatre and nature, elements that always go with her and considers essential in teaching. She’s identifies with this beautiful Maori phrase: "Ko te ahurei or te tamaiti arahia ō tātou mahi” - Let the uniqueness of the child guide our work. "